Last week we had Stacy and Lady M comment on an episode of The Twilight Zone. That show used to freak me out as a kid! They referred us to an episode that dealt with a family who took shelter in a safe room and what happened with their neighbors who hadn’t prepared. It was very good and not too freaky. The episode is called the shelter and really is a great place to start a conversation. It would be great to show at the beginning of a discussion on preparedness. For older children it would also be a great conversation starter and point out why we prepare and why we don’t tell everyone exactly what we have and what we are doing. With all the interest and discussion in our yahoo group about EMPs I would also recommend again the book: One Second After . It is fiction and may not all be appropriate to share with your family but it will give you some ideas about what topics to discuss and how to prepare for a society without electricity and the perks that go along with that. With spring storm season upon us and tornado season approaching let’s take a look at ways to protect against their fury. A safe room has traditionally been defined as a place where the family can gather and wait out a storm under the safest possible conditions. In recent years we have seen the evolution of the safe room. A safe room is now defined as a concrete or reinforced “bunker” in your home, basement or garage. Homes in tornado- and hurricane-prone areas are now often built with a concrete safe room in the center of the home. Concrete safe rooms can be expensive to add to an existing home. As you save to build your bunker, there are some immediate steps you can take to improve your chances of surviving a weather emergency. Nothing will protect you completely or under all circumstances, but your chances for survival are greatly improved if you have a well-equipped safe haven. Begin by choosing an area in the center of the house that has no windows. A bathroom or large closet under a staircase will work well. A basement is the best location in tornado or hurricane country, but only if you are located away from a storm surge area or flood plain. Reinforcing the structure of your safe haven is definitely something you should consider doing now. Remove the sheet rock and bolt the framing to the floor and to each other where the corners of the room and the ceiling meet. Add more bracing between the studs. In extremely high winds, debris can be thrown at a building with enough force to penetrate even masonry walls, so our objective is to protect the room against penetration. Adding sheets of plywood to the walls will greatly increase the safety of your safe haven since most injuries during a storm are caused by this flying debris. Although plywood is not going to completely prevent debris from penetrating your haven, it will provide greater protection than sheet rock alone. Don’t forget to re-enforce the ceiling, because debris can be forced through the ceiling as well. Remember high winds cause the twisting of building components, so your job with all this reinforcement is to help minimize that twisting. If you have hollow core doors, you will also want to replace these with solid wood or metal doors. Before entering your safe room or safe haven, close all doors in your home. Close and lock all windows in your home, too. Lower all blinds, and close all of the drapes. Shut off the air conditioner and heater. We used to believe opening a window would help in a storm. It does not. Any time you invite air into your home you increase the damage. AM/FM radio — battery or crank operated. Glow sticks or flashlight — NO CANDLES (for safety in case of gas leak). Your 72-hour kits , for use after the storm has passed. Important documents, which should already be in your 72 hour kits. Personalized phone directory with local emergency numbers as well as the numbers for out of state contacts. Local lines may not be available and your only communication option may be out of state or out of the area contacts. If you have walkie-talkies , use them if you must be separated after the storm or event – phones may not be working. Folding shovel and axe to help you dig out. Although most storms pass fairly quickly and you may not need all these items, they will become very valuable after the storm has passed. During the storm, cover family members with blankets and pillows to protect from debris. When you are sure the storm has ended, be careful when exiting your room. There may be unexpected debris as well as rodents, snakes and insects that are not normally present. Never exit without shoes on. Watch for downed power lines and stay at least 30-feet away from any you encounter. Remember that water conducts electricity. If it is night and you are confident there are no gas leaks or danger of further collapse, wait until there is light outside before leaving the immediate area. If you do smell gas or your home is unstable, take your 72-hour kit and leave the area. Listen to the radio for directions to shelters or other information to determine which areas are safe to evacuate to and which are not. 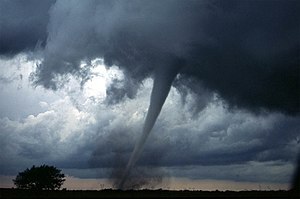 If you are in the center of a tornado or hurricane, nothing except a concrete safe room will completely protect you. If you are outside the center of the storm a safe haven may well save your life.